Here is a sneak peek at one of the halloween costumes I'm working on... we have a bumblebee. I just had to show you guys how to make some wings before the big day arrives. Making tulle wings to go with a children's halloween costume is a piece of cake. 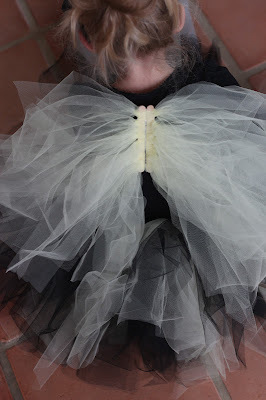 Basically you just need to know how to make a no sew ballerina tutu and instead of tying the tulle onto a circle of elastic or ribbon, tie it onto a couple of popsicle sticks. 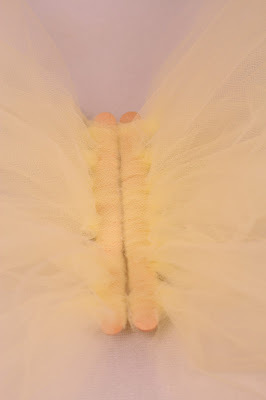 Cut tulle just like in the ballerina tutu tutorial. 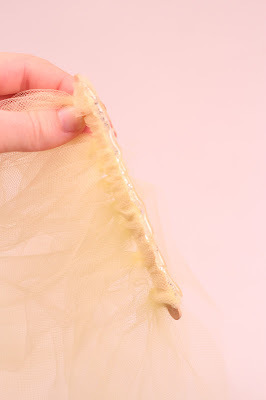 You need about a yard of tulle rather than the two yards of tulle I talk about in the ballerina tutu tutorial. Tie onto the popsicle stick just like the ballerina tutu tutorial. Do this to two popsicle sticks. 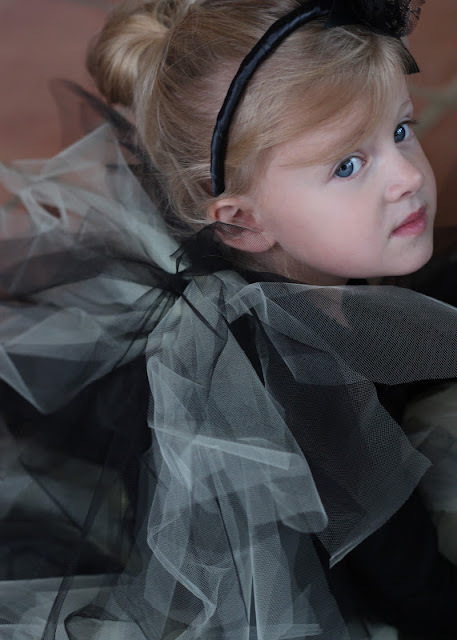 You can also spray paint the popsicle sticks before hand to match the color of tulle. 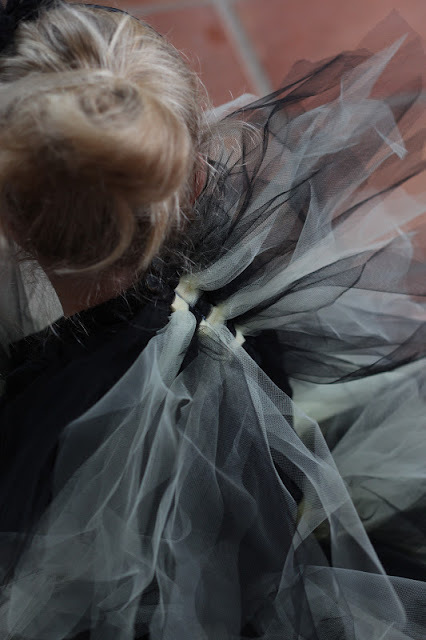 Trim the edges of the wings to desired length and give it an even look. Hot glue a couple of shoulder straps onto the back. 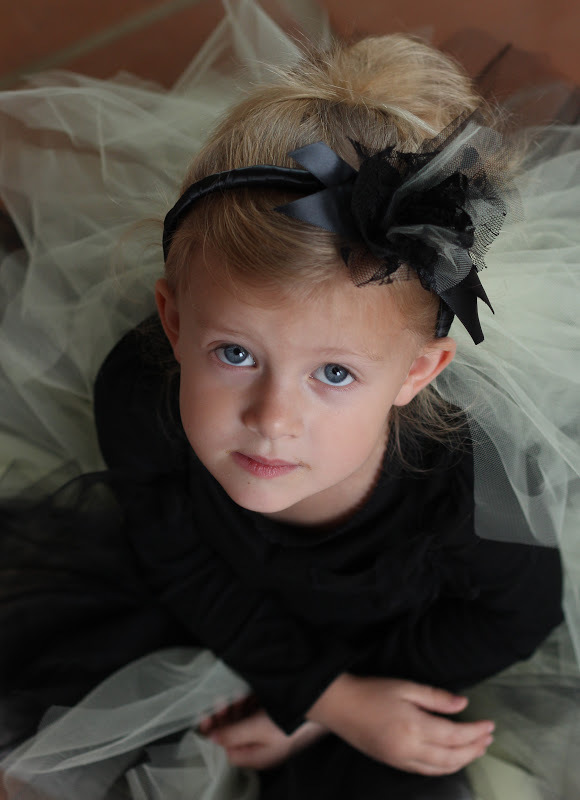 I used two strips of black tulle for this because it is stretchy and matches her black shirt. Here's the end result! Happy Halloween! How'd you make the headband? How did you attach the wings to the child? I hot glues some black should straps onto it. You can't see it because her shirt is black, but imagine it like a backpack. Hope that helps!